Successfully Added Power over Ethernet IP Camera with Angle Control and Motion Detection to your Shopping Cart. The ultimate IP security camera that comes with Power over Ethernet (PoE) and motion detection alarm recording function has arrived. 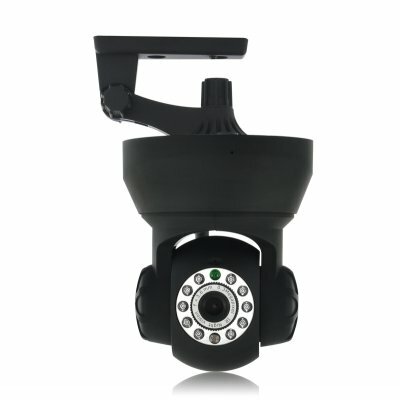 With this IP camera, you can view live video feed from your camera anywhere in the world, complete with amazing features like POE, night vision, email alert, motion detection, and even tilt and maneuvering functions with a click of the mouse. With the included software, you can manage an array of functions and change, modify, implement, view, and do so much more than just sit and watch. Whether you're at an airport or a coffee shop, or you're on a business trip thousands of miles away, you'll be able to check the security status of your home or business from any computer in the world that has an internet connection. The PoE function is what makes this IP camera awesome. It brings simplicity, convenience and efficiency by providing the Internet and power supply through a single cable. No more messy and inconvenient wires, no more reliance on a power supply in the middle of nowhere, just plug in the single Ethernet cable and you are ready to go. This powerful smart IP security camera with POE, night vision and motion detection recording is in stock now, and available to you at a factory wholesale price. Click "add to cart" now and we will express ship out your order tomorrow. Good for dropship sales as well as internet storefronts. The PoE injector (adapter) is not included. To be able to use PoE function, please buy a 5V DC PoE injector or a POE compatible router.